Construction of the viaduct Bellinzona–Lugano for the high-speed rail of the new trans-Alpine railway. The structure spans a total distance of 443 metres. The viaduct is divided into five sectors of varying distances, from 110 metres to 45 metres. The height varies from 5.10 to 2.70 metres from the ground with a longitudinal inclination of 12.6‰. The total cast section will be around 11 square metres per linear meter, making around 1100 cubic metres of concrete divided among four castings. An important requirement of the contractor was the use of support structures made of 18 concrete provisional pillars 50x50cm to support the construction of the deck and would then have to be demolished once the building work had been finished. However, the decision to use Pilosio’s MP heavy duty towers meant, above all, that a lot of time could be saved. 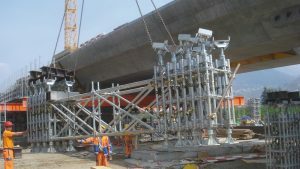 Pilosio supplied 18 heavy duty MP towers coupled in pairs by means of horizontal stiffeners. For this project, the towers have been designed to support loads up to 3200kN per tower. 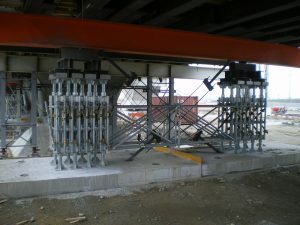 Each column is formed of 4 MP standard connected together every 50 cm by a 17 cm double clamp device with load capacity of 200kN. Rows of 4 columns are connected one to the other by the 17 cm double clamp. Each tower is obtained by connecting two parallel rows of 4 columns with MP 47 cm ledger. The final heavy duty tower is made of 2 towers coupled in pairs by means of 200 cm ledgers and braces. The supply also envisaged the use of reinforced and adjustable base plates and forks. In order to distribute equally the 3200 kN load between the 16 columns of the tower, the Pilosio technical dept. has provided a grid of 3 steel HEB beams on the top of the forks. The adjustment of the heights of the towers is achieved by adjusting the forks and the reinforced base plates. The stiffening systems between pairs of towers enables them to be moved en masse. This solution allowed the optimum number of workers to be employed in the assembly and dismantling phases. The heavy duty towers used for this project were made from standard components of the MP multidirectional system, combined with a series of specific accessories.